Krispy Kreme has something exciting for you on National Coffee Day! Buy 2 12oz. 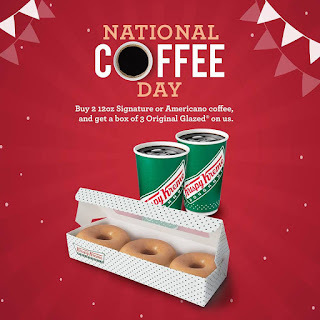 Signature or Americano Coffee and get a box of 3 Original Glazed for FREE! Available on September 29-October 1, 2017. Offer is valid in all Krispy Kreme stores except MOA Arena and Airport stores.